All successful e-Commerce businesses have one thing in common: Terrific e-Commerce fulfillment. You might have an epic website, a shopping cart that is capable of sliding your customers effortlessly to checkout and most importantly, the best products in the world. But if your e-Commerce fulfillment operation fails to run smoothly, your web-based business will be all show and no go. e-Commerce fulfillment isn’t exactly the most pleasant part of running a business. But at the same time, it could very well be the one thing that catapults your e-Commerce business to success. Punctual and accurate fulfillment equals happy customers and positive feedbacks, and a robust e-fulfillment system can save you valuable time and money to expand your business. Probably without you even noticing it, e-Commerce fulfillment is all over the place. It has been an integral part of your business all along. You were your own e-fulfillment provider when you were packing boxes in your garage, or sticking labels onto your packages. Now that your business has grown, you probably outsource your fulfillment to a third-party logistics (3PL) service – where Boxme and our fulfillment solutions come to mind, but let’s talk about this later. e-Commerce fulfillment is also the part where you actually deliver your product to your buyers. It includes everything from getting product onto fulfillment center shelves to picking, packing and shipping orders. When you think of a warehouse, you probably imagine rows of shelves filled with products. At its core, however, every good e-Commerce fulfillment center is a whole technology company. Your e-Commerce store should integrate seamlessly with your fulfillment center, so orders flow directly to the people who are responsible of sending them out. Specifically, if you are an omni-channel seller, your 3PL company should help you sync with every platform on which you sell, and do so cost-free is most ideal. Receiving and inventory management are the parts where many fulfillment warehouses fall short. A single backlog of pallets sitting on a loading dock means your products aren’t in inventory, and no inventory means no sales. This, of course, is not a good thing. A top-notch e-fulfillment services company should be able to move your goods from the loading dock into inventory within one to two days at most. Another aspect related to inventory management is shrinkage – in other words: Loss, theft, and breakage. Some fulfillment centers make inventory management a top priority and will take responsibility for any items that are lost or broken while on their shelves. In this case, you don’t have to account for shrinkage when you are calculating ideal stock levels. When an order comes in, fulfillment warehouses will pick the right items to put in different boxes, pack them carefully, and ship them to your customer. That’s how the pick, pack, and ship process goes. It’s important to look for a 3PL provider that offers next-day turnaround, or even same-day shipping. Since if your orders are turned around quickly at the warehouse, you won’t lose the benefit of that saved shipping time. Ease of returns is crucial from shoppers’ perspective and can be a major factor in driving your sales. On the other hand, receiving returns and putting items back into inventory for you is also a crucial component of e-Commerce fulfillment. The faster returns are handled, the quicker your customer will get a refund. Efficient returns processing also puts your stock back on the shelf as soon as possible, making it available again. Returns are kind of a hate-it-or-love-it part of e-Commerce – troublesome but ultimately rewarding. A good e-fulfillment center is expected to make returns as easy as possible for both you and your customers. Should you outsource fulfillment services? Making the decision to outsource your logistics functions can be a tough one. But given the volatility in transportation rates, booming e-Commerce, changing government regulations and the constant rush of new technology, it’s getting harder to do it all on your own. Before the 2000s, most companies handled their own shipping and logistics. They may have owned assets, like trucks and a warehouse, or contracted for those services directly. But as supply chains became more complex and technologically driven, companies began outsourcing logistics to third parties. Today, many companies refer to a 3PL for outsourced logistics services, including transportation, warehousing, cross-docking, inventory management, packaging and freight forwarding. 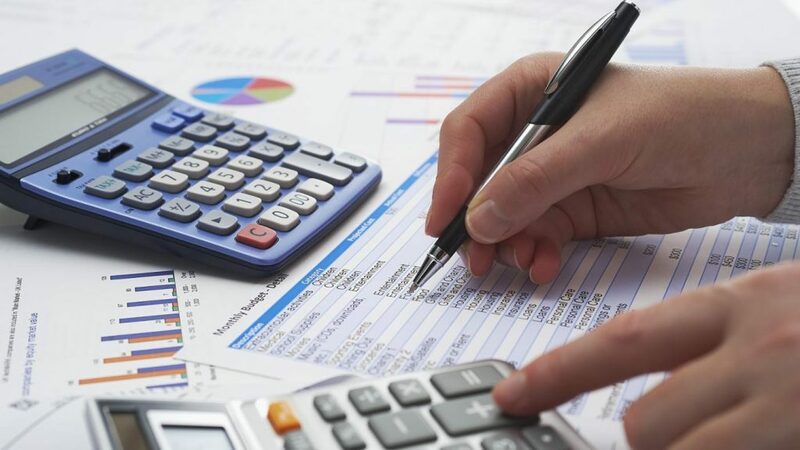 Many enterprises are even outsourcing other non-core functions, such as accounting, IT, and human resources. Enterprises may contract with a number of 3PLs to manage specific traffic segments or customer bases. Or, they can outsource the entire supply chain. The 3PL makes the day-to-day operational decisions, allowing the internal staff to focus on what they do best. Typically, these services are bundled to provide a single point of contact for all (or some) portion of the company’s supply chain. Shippers will typically consider outsourcing logistics when there’s a change in the company’s structure or strategy, or simply when costs are on the rise and service levels are falling. A 3PL can help your company scale as it grows organically or through mergers & acquisitions, and adapt the supply chain to incorporate the latest digital commerce capabilities. Are you contemplating entering new markets, either geographically or into a new customer segment? A 3PL may be able to provide you with the flexibility to scale up quickly with lower capital investment risk during this transition for your company. To help you make the decision that’s right for your organization, here are some advantages of outsourcing logistics to consider. The goal of the 3PL is to develop a long-term strategic alliance with the client. Contrasting to a transportation broker, which is typically only focused only on moving freight from Point A to point B on a transactional basis, a 3PL will be invested in your company on a deeper level. 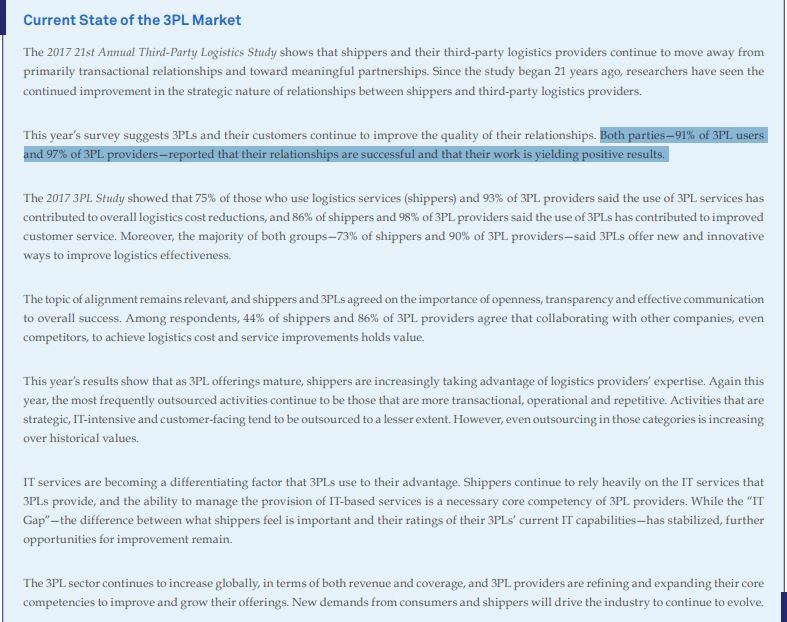 In fact, 91% of 3PL users and 97% of 3PL providers perceive their relationships with each other to be successful. They also find that their work together tends to yield positive results, as reported in the 2017 Third Party Logistics Study from CapGemini and Penn State University. Because of its breadth of experience, a 3PL will include people, processes and technology at a level beyond what a single company can develop independently. Despite fluctuating capacity, increased shipper demands and disruptions within the industry, a 3PL has the experience to manage the supply chain using information and analytics to drive decisions. The 3PL will help you figure out the most efficient routing for your goods. You will have expert help as you assess options, such as truck-load vs. less-than-truckload vs. parcel carriers – which are among the best choices to serve customers and manage costs. The 3PL can also take over inventory management and warehouse operations as needed. 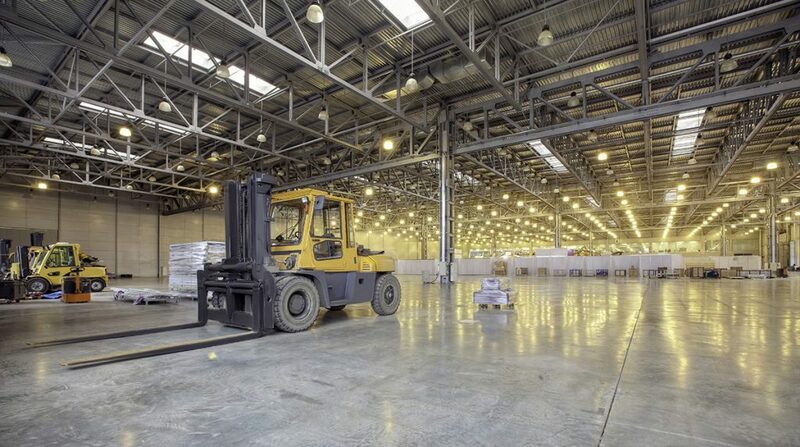 ->> See also: e-Commerce Fulfillment Network: How Many Warehouses do You Really Need? One of the major advantages of outsourcing logistics to a 3PL is the access you will gain to the latest technology. One example is the Internet of Things (IoT) functionality that is already becoming standard in many supply chains. 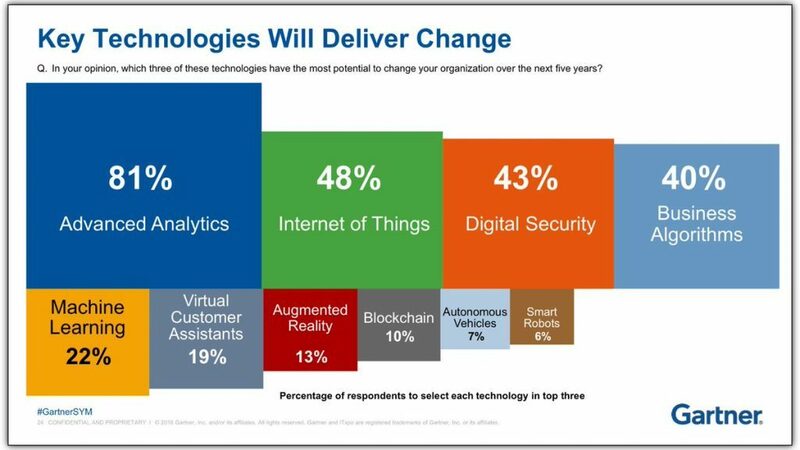 In fact, 48% of respondents from supply-chain-intensive industries say IoT will be the driver of significant change, or transformational at the very least, according to the 2016 Gartner CEO and Senior Business Executive Survey. The ability to manage IT-based services is a necessary core competency of leading 3PLs. Shippers come to rely heavily on the IT services that 3PL’s provide. 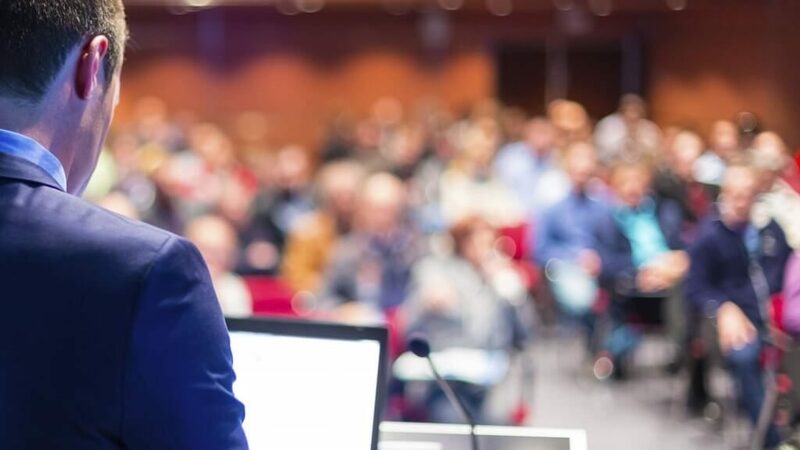 These services are always integrated into the customer’s system, typically replacing legacy systems and processes with a mix of cloud-based, API and commercial solutions, along with proprietary innovations. This creates a powerful custom technology stack. By outsourcing logistics to a 3PL, you will also have the advantage of real-time inventory updates. Think of the benefits this will have for field service, healthcare, retail and other forward-deployed inventory strategies. For instance, end users will now have the ability to access inventory via mobile devices, which will shorten field service response times. With greater visibility into the supply chain, a 3PL can help reduce inventory and reverse logistics costs. It will also increase cash flow through faster fulfillment. A 3PL brings with it an existing network of valuable carrier relationships, which can save you an extra 10-25% off already discounted freight costs. The 3PL analyzes your current freight shipments and rates, and bids out the work to multiple freight carriers. An established 3PL will be able to negotiate much higher discounts than the manufacturer alone. Think of this as if you were grocery shopping. You get a better price shopping in bulk at BigC than at your local 7-Eleven store. In addition to these contract negotiation savings, a 3PL will catch cost saving errors freight audit and payment. In this process, the 3PL examines, adjusts and verifies your invoices for accuracy. They then issue the payment to the carrier on your behalf. The best part is, there is no out-of-pocket cost to you. The 3PL is paid a pre-negotiated percentage of the savings. Your savings come from the increased discount from carriers, eliminating freight bill errors, and reducing your in-house payroll. The other place you will notice a cost savings is on your payroll line. These savings typically come from the 3PL’s customer service team and technology capabilities. The 3PL’s customer service team becomes a direct extension of your team. They take over the responsibilities of claims management, track and trace, expediting, data procurement, reporting, invoicing, and auditing. All of these tasks alone consume hours of labor cost. The average cost of labor to verify, process and pay an internal freight invoice is $11. But, with a 3PL, this activity is only approximately 5% of that internal cost. Those activities alone save your company $10.45 per invoice. 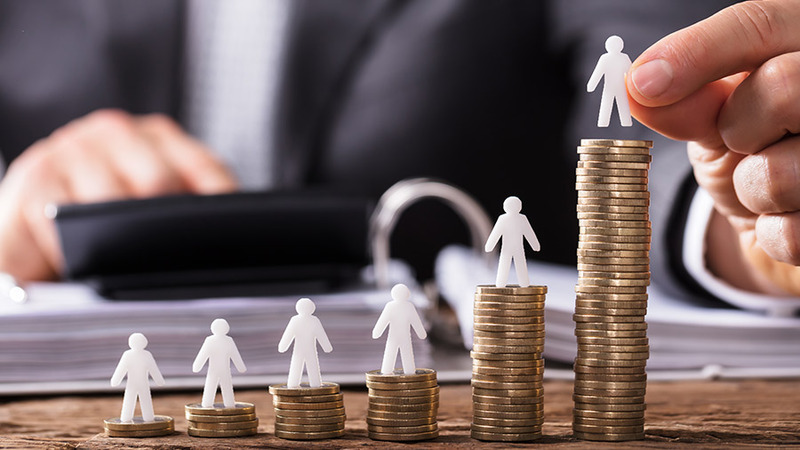 Most importantly, outsourcing these tasks to a 3PL allows you to reallocate your resources and concentrate on what your company is best at: providing services and generating products. A 3PL can scale up or down quickly to respond to demand without sunk costs for personnel, real estate or equipment. 3PLs are built to manage time-sensitive deliveries, lean supply chains and shorter lifespan products. Another advantage of working with a 3PL is their ability to react quickly when consumer demand or other variables occur that will require strategic changes. As your business grows, the 3PL will be able to scale accordingly. For early-stage companies, the 3PL can provide the requisite level of service without the capital investment. When a company grows organically or through mergers and acquisitions, the 3PL can add services and capacity as necessary. A 3PL can also support rapid expansion into new markets or new supplier sources, such as expanding e-Commerce, buy online-pick up in store and other omnichannel initiatives. So let’s say you’re the boss of your newly established e-Commerce company. It’s understandable you would want to ask a lot of questions to make sure you choose the most suitable 3PL fulfillment provider. That said, the hard part is knowing what you should be asking. What types of products do you ship? Odd as it might sound, this is one of the most important questions to ask. With a wide range of warehouses, Boxme specializes in handling large and heavy items as well as not-so-bulky ones, and could confidently give you the best advice on how to properly pack and ship your products. The same can be said for hazardous materials or fragile merchandise. If you’re determined to find a fulfillment solution for the types of goods you sell to save money on packaging and shipping, look no further. Do you offer shipping discounts? Because we are looking at volume shipment quantities, we of course qualify for discounted shipping rates from DHL, UPS, and other major freight companies that we’re cooperating with. We will make sure that discounts get passed on to you. What are the charges for setting up my account and integrating my sales platforms? None. Simple as that! What value-added services do you offer? Our warehouses can kit your merchandise, potentially add value to your e-Commerce business and increase your profit margin. Additionally, we include things such as adding custom lettering, labeling or assembling parts on your request. How do we create order? You can easily create order via our system or connect your stores in various e-commerce marketplaces like Ebay, Amazon, Shopify, Magento with our system to process order automatically. Do you provide local or global services? Our solutions are comprehensive for both local and global merchants. Global merchants can choose to fulfill their orders in South East Asia to save cost and get their products delivered worldwide at an optimized delivery cost. What inventory management and inventory control services do you offer? Boxme provides 2 storage conditions for customers including normal storage (with conventional products) and cool storage (25oC) (applied for cosmetic goods, functional foods and products requiring cool storage). As far as storing, we offer 2 options: Storage by product and storage by shelf. For storage by product, BoxMe will store your goods on standard shelves; we will base on the time from storage to the packaging of each product to charge storage cost. For storage by shelf, base on the products Boxme will convert products into standard categories (S1, S2, S3, S4, S5, S6). A standard rack of Boxme is 2m x 0.4m = 0.8m2. What is your policy on inventory storage charge? BoxMe warehouses will be free of charge for storage within the first 30 days. You do not have to pay for storage costs, maintenance fees, warehouse staff for 30 days. What is your system for shipment tracking? Shipment notifications go directly to us and to you. Notifications include tracking numbers so that we can follow up on shipments with the carrier and troubleshoot instantly when needed. 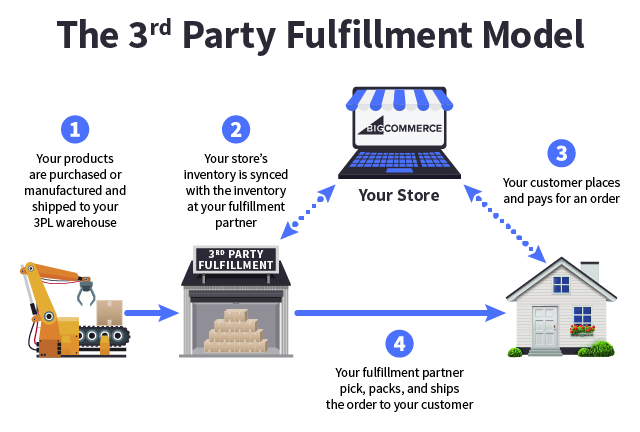 A successful e-Commerce fulfillment process involves multiple vendors and schedules all lining up to run. The better you manage all these moving pieces, the greater your chance to win at e-Commerce. Let Boxme help you build such a well-oiled machine in the Southeast Asia region in general, and in Indonesia in particular. Do you know choosing to fulfill your orders automatically at Boxme can save you up to 70% logistics cost in selling cross-border? BoxMe is the premier cross-border e-Commerce fulfillment network in South East Asia, enabling world-wide merchants to sell online into this region without needing to establish local presence. We are able to deliver our services by aggregating and operating an one-stop value chain of logistic professions including: International shipping, customs clearance, warehousing, connection to local marketplaces, pick and pack, last mile delivery, local payment collection and oversea remittance. If you have any question about Boxme Asia or how we can support your business, please contact us directly by referring to our hotline. We are glad to be of service! What is e Commerce Packaging and Just How Important is It to Your Business?